Amyloid-beta precursor protein. Flexible portions that are not included in the structures are shown with dots, and the membrane is shown schematically in gray. Like Dr. Jekyll and Mr. Hyde, some seemingly innocent proteins have evil alter egos. The amyloid-beta precursor protein is an important example. It is a large membrane protein that normally plays an essential role in neural growth and repair. However, later in life, a corrupted form can destroy nerve cells, leading to the loss of thought and memory in Alzheimer's disease. Amyloid-beta precursor protein (APP) is a complicated protein with many functions. It is found on the surface of cells throughout the body. Like many membrane-tethered proteins, it is composed of several domains connected by flexible linkers, making it difficult to study as one intact piece. Looking to the PDB, we can find four pieces of APP, including three domains that extend on the outside of the cell (from top to bottom in blue, PDB entries 1mwp , 1owt , and 1rw6 ), and a special peptide that crosses the membrane (in green, from PDB entry 1iyt ). There is also a small domain inside the cell, shown schematically here at the very bottom with a circle. APP plays roles both as an intact membrane protein and when broken into pieces. It appears to play a central role in several processes, so it has been difficult to tease out all of the details and many of the functions of APP are still being discovered and studied. The intact protein is a receptor protein that sends signals through the G-protein system. It also binds to many structural molecules outside cells, such as heparin and laminin, so it may play a role in cell adhesion. APP is also broken into several functional fragments by a set of dedicated proteases, termed secretases. These proteases cut on either side of the small peptide shown here in green. The large piece on top is then released outside the cell, where it helps control nerve growth, and the small piece at the bottom is released inside the cell, where it interacts with the protein-synthesis machinery in the nucleus. The little peptide remaining in the middle is the portion that has received the most study, since it is a central player in Alzheimer's disease. This little peptide is termed the amyloid-beta peptide, and it causes damage all out of proportion to its small size. In the full-length protein, it extends through the membrane, anchoring the protein. 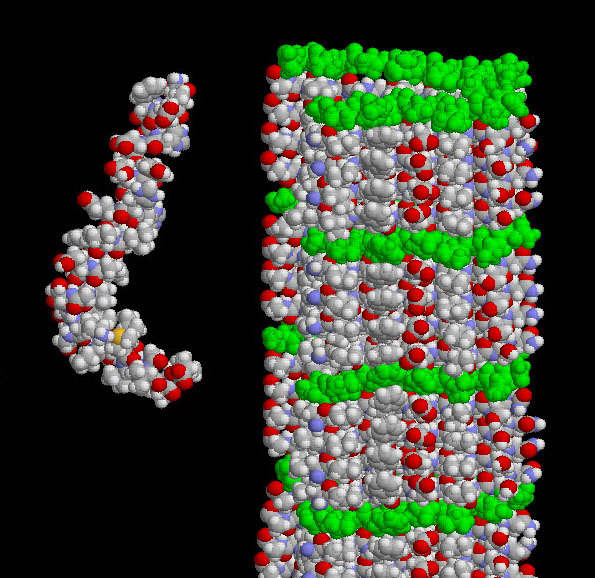 But as a free peptide, it leaves the membrane, changes shape and aggregates into long fibrils. These tough fibrils form dense plaques on nerve cells. The gradual accumulation of these plaques, along with the accumulation of a second protein inside nerve cells, leads to the onset of dementia as the brain slowly loses normal function. Beta-secretase with an inhibitor (green) in the active site. Several secretase enzymes break amyloid-beta precursor protein into its component parts. 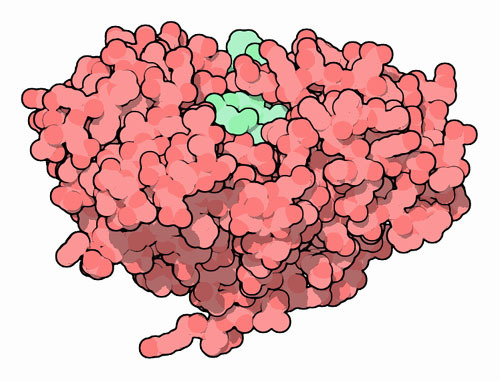 Beta-secretase, shown here from PDB entry 1fkn , makes the cut that releases the large portion outside the cell. It is a typical aspartyl protease, similar to the pepsin that digests proteins in your stomach. This structure has a small peptide in the active site, colored green here, and the enzyme is normally found tethered to the cell surface by a short extension, not seen in the crystal structure. Gamma-secretase, not shown, makes the cut at the bottom of the amyloid-beta peptide. It is a particularly unusual enzyme because it can cut a protein chain inside a membrane. Looking in the PDB, you can find structures of the amyloid-beta peptide in its two guises. The structure on the left (PDB entry 1iyt ) shows the peptide as it might look when interacting with the membrane. Most of it is folded into an alpha helix, forming a more-or-less extended structure. The structure on the right (PDB entry 2beg ) shows the form in the amyloid fibril. Thousands of the peptides stack on top of one another, each one interacting with its neighbors to form a long beta sheet. This picture was created with RasMol. You can look at the structures by clicking on the accession codes here and picking one of the options for 3D viewing. Note that these structures were determined by NMR, so they have an ensemble of similar structures in the PDB file and many graphics programs will show a collection of overlapped structures. P. R. Turner, K. O'Conner, W. P. Tate & W. C. Abraham (2003) Roles of amyloid precursor protein and its fragments in regulating neural activity, plasticity and memory. Progress in Neurobiology 70, 1-32. C. Morgan, M. Colombres, M. T. Nunez & N. C. Inestrosa (2004) Structure and function of amyloid in Alzheimer's disease. Progress in Neurobiology 74, 323-349. C. Reinhard, S. S. Hebert & B. de Strooper (2005) The amyloid-beta precursor protein: integrating structure with biological function. EMBO Journal 24, 3996-4006.